Camden Lakeway offers beautiful lake and mountain views from our one and two bedroom apartment homes in Lakewood, Colorado. Conveniently located near US-285 and C-470, Camden Lakeway is centered in the serene Grant Ranch Neighborhood. Premier Schools, stunning scenery and plenty of lifestyle offerings surround our charming community. Camden Lakeway offers newly redesigned apartment homes featuring stainless steel appliances, quartz countertops with undermount sinks, white subway tile backsplash, custom white cabinetry with brushed nickel finishes, hardwood-style flooring and cozy gas fireplaces. Spacious walk-in closets and a private balcony/patio add to your Camden Lakeway living experience. Our pet-friendly community offers a fenced-in dog park, as well as multiple pet stations for your convenience. Swim laps in the resort-style swimming pool with a lake view, rejuvenate yourself in our saunas, and work up a sweat in our state-of-the-art fitness center, open 24 hours a day. Shoot some hoops in our multi-sports court, challenge your friends in our game room and celebrate your victory with our on-site kegerator! You will be delighted by all the comforts and activities available to you, without even having to leave the community. Entertain friends at three outdoor grilling stations and fireside lounge, be productive in our business center and Wi-Fi enabled clubhouse, or take a leisurely stroll around the lake in the heart of Camden Lakeway. Clement Park, Raccoon Creek Golf Course, Bowles/Marston Lakes and Red Rocks Amphitheater are all a sampling of attractions that are minutes away. We also have a technology package that boast savings of up to 51% off retail. This money-saving package includes high-speed internet up to 150 Mbps and over 140 digital video channels through Xfinity. Use the Xfinity Go app on your smartphone or tablet to access your digital video anywhere! 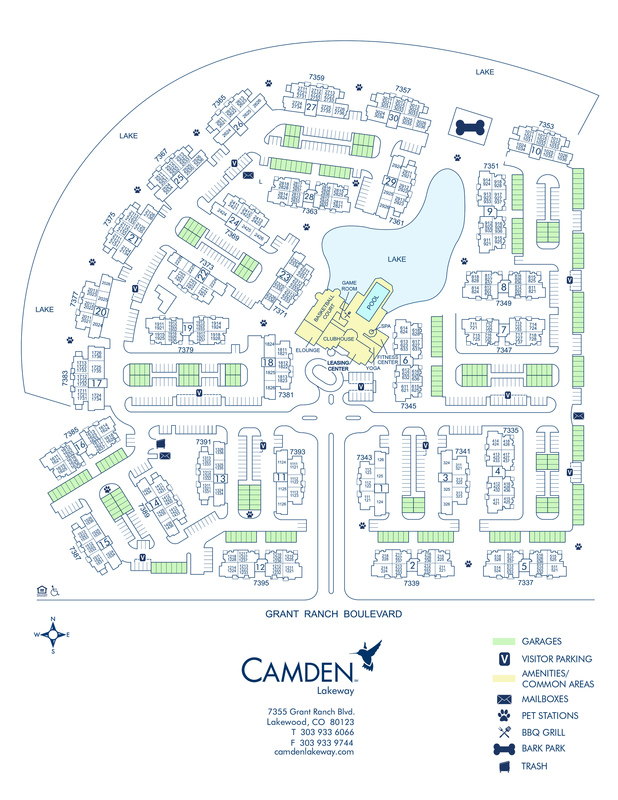 Camden Lakeway is more than just an apartment community – it’s your next home. We'll save a spot for you! We offer one garage per apartment home with ample open parking for our residents, on a first-come, first-served basis. Want a reserved spot? Not a problem! We offer that, too. Visitors are welcome to park in the designated visitor parking located throughout the community.